iPhone 7 Screen Repair includes delivery to all towns within 15-20 miles of Farnham. We have been installing 100% Genuine Apple iPhone Screens to businesses and residents in Surrey for over 4 years. Our service is very different to a walk-in shop service in that we go directly to you at your home, work or even at a shopping centre so you can work, relax at home or shop while we repair your iPhone 7 screen in our mobile phone repair unit. All screens are covered by our 120 day warranty. To find out more about our iPhone 7 Screen repair warranty then please view our Warranty page. iPhone 7 Screen repair and iPhone 7+ screen repair typically takes between 10-15 minutes of arrival. We supply the Genuine Apple iPhone 7 LCD screens directly to your door so there is no need to visit and wait a long time at an Apple store for your phone to be repaired. It has come to our attention that the iPhone 6S and iPhone 7 phones are being damaged beyond repair by shops installing the cheap copies. There is a known issue with the cheap screens where the button ribbon is not certified by Apple – When the phone detects this it will disable the TouchID on a 6S PERMANANTLY or disable the whole button and TouchID on an iPhone 7 -In the case of the iPhone 7 your button will function again correctly if a genuine screen is reinstalled but this is certainly not the case with the 6S. It is impossible to the repair the button on an iPhone 7 and maintain functionality. If the iPhone 7 detects a genuine home button with a different signature or a non-genuine button then the button will be rendered useless and the phone will automatically load the accessibility (on screen) virtual home button. All of our latest generation iPhone screens are 100% original (not original refurbishments) but availability is very limited for these screens and as such they can be quite expensive. iPhone 7 Screen Repair with a Genuine Original Apple LCD screen – £130 when booked here or £135 when booked over the phone. 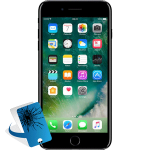 Book your iPhone 7 Screen Repair on-line today.